Waldo Concepcion, MD, FACS co-developed the Liver Transplant Program at California Pacific Medical Center from 1988-1994, at which time he and his team then moved the program to Stanford. In 1996 he was named Director of the Transplantation Institute at Loma Linda University Medical Center, founding the Pediatric Liver Program and serving as Surgeon and Chief over the Multi-Organ Transplant Program. Under his leadership, the program became a leading Transplant Center, reported as one of the highest patient and organ graft survival rates in Sothern California, and earned the Institution distinction of Centers of Excellence among Health Care Organizations. In 2005, he returned to Stanford as the new Chief of Pediatric Kidney Transplantation at Lucille Packard Children’s Hospital and continued the tradition of leading one of the best transplant programs in the world. In 2006, he was named Chief of Clinical Transplantation at Stanford University. 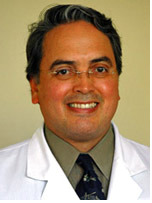 Dr. Concepcion has published over 100 articles and book chapters in scientific literature. 1. Bailey L, Nehlsen-Cannarella SL, Concepcion W, Jolley WB. Baboon-to-Human Cardiac Xenotransplantation in a Neonate. JAMA, 254(23):3321-3329, 1985 Dec 20. 2. Bailey L, Concepcion W, Shattuck H, Huang L. Method of Heart Transplantation for Treatment of Hypoplastic Left Heart Syndrome. J Thorac Cardiovasc Surg, 92(1):1-5, 1986 July. 3. Starzl T, Todo S, Tzakis A, Gordon RD, Makowka L, Steiber A, Podesta L, Yanaga K, Concepcion W, Iwatsuki S. Liver Transplantation: An Unfinished Product. Transplant Proc, 21(1 pt 2):2197-2200, 1989 Feb.
4. Starzl TE, Demetris AJ, Todo S, Kang Y, Tzakis A, Duquesnoy R, Makowka L, Banner B, Concepcion W, Porter KA. Evidence for Hyperacute Rejection of Human Liver Grafts: The Case of the Canary Kidneys. Clin Transplant, 3:37-45, 1989. 5. Tokunaga Y, Wicomb WN, Concepcion W, Nakazato P, Cox K, Esquivel CO, Collins GM. Improved Rat Liver Preservation Using Chlorpromazine in a New Sodium Lactobionate Solution (SLS). Transplant Proc, 23(1 pt 1):660-661, 1991 Feb.
6. Cox K, Nakazato P, Berquist W, Concepcion W, Tokunaga Y, Esquivel CO. Liver Transplantation in Infants Weighing Less Than 10 kg. Transplant Proc, 23(1 pt 2):1579-1580, 1991 Feb.
7. Concepcion W, Esquivel CO, Terry A, Nakazato P, Garcia-Kennedy R, Houssin D, Cox KL. Liver Transplantation in Langerhans’ Cell Histiocytosis (Histiocytosis X). Semin Oncol. 18(1):24-28, 1991 Feb.
8. Tokunaga Y, Wicomb W, Concepcion W, Nakazato P, Collins GM, Esquivel CO. Successful 20-hour Rat Liver Preservation Using Chlorpromazine in Sodium Lactobionate Sucrose Solution. Surgery, 110(1):80-86, 1991 Jul. 9. Esquivel CO, Nakazato P, Cox K, Concepcion W, Berquist W, Russell TR. The Impact of Liver Reductions in Pediatric Liver Transplantation. Arch Surg, 126(10):1278-1285; discussion 1285-1286, 1991Oct. 10. Szpakowski JL, Cox K, Nakazato P, Concepcion W, Levin B, Esquivel CO. Liver Transplantation: Experience with 100 Cases. Wester J Med, 155(5):494-499, 1991 Nov.
11. Nakazato P, Cox K, Concepcion W, Gish R, Berquist W, Imperial J, Esquivel CO. Early Experience with FK 506 Induction Immunosuppression: Suggestion for Using Oral FK 506. Transplant Proc, 23(6):3019-3020, 1991 Dec.
12. Nakazato PZ, Concepcion W, Bry W, Limm W, Tokunaga Y, Itasaka H, Feduska N, Esquivel CO, Collins G. Total Abdominal Evisceration: An En-Bloc Technique for Abdominal Organ Harvesting. Surg, 111(1):37-47, 1992 Jan.
13. Tokunaga Y, Concepcion W, Berquist WE, Cox KL, Wiviott LD, Garcia-Kennedy R, Itasaka H, Nakazato P, Esquivel CO. Graft Involvement by Legionella in a Liver Transplant Recipient. Arch Surg, 127(4):475-477, 1992 Apr. 14. Itasaka H, Hershon JJ, Cox KL, Tokunaga Y, Concepcion W, Nakazato P, Esquivel CO. Transient Deterioration of Intrapulmonary Shunting After Pediatric Liver Transplantation. Transplantation, 55(1):212-214, 1993 Jan.
15. Nakazato P, Itasaka H, Concepcion W, Lim J, Esquivel CO, Collins GM. Effects of Abdominal En-Bloc Procurement in High Sodium Preservation Solution in Liver Transplantation. Transplant Proc, 25(1 pt 2):1604-1606, 1993 Feb.
16. Tokunaga Y, Cox KL, Coleman R, Concepcion W, Nakazato P, Esquivel CO. Characterization of Cholecystokinin Receptors on the Human Gallbladder. Surg, 113(2):155-162, 1993 Feb.
17. Meister RK, Esquivel CO, Cox KL, Concepcion W, Berquist WE, Nakazato P, deVries PA. The Influence of Portoenterostomy with Stoma on Morbidity in Pediatric Patients with Biliary Atresia Undergoing Orthotopic Liver Transplantation. J Pediatr Surg, 28(3):387-390, 1993 Mar. 18. Nakazato PZ, Cox KL, Concepcion W, Berquist WE, Esquivel CO. Revascularization Technique for Reduced-Size Liver Transplantation for Infants Weighing Less Than 10 kg. J Pediatr Surg, 28(7) 923-926, 1993 Jul. 19. Gish RG, Lee AH, Keeffe EB, Rome H, Concepcion W, Esquivel CO. Liver Transplantation for Patients with Alcoholism and End-Stage Liver Disease. Am J Gastroenterol, 88(9):1337-1342, 1993 Seb. 20. Menegaux F, Egawa H, Keeffe EB, So SK, Concepcion W, Collins GM, Esquivel CO. Comparative Effects of Blood, Colloid, and Ringer’s Lactate Terminal Allograft Rinse on the Results of Orthotopic Liver Transplantation. Transplant Proc, 25(6):3196-3198, 1993 Dec.
21. Tokunaga Y, Cox KL, Itasaka H, Concepcion W, Nakazato P, Esquivel CO. Characterization of Cholecystokinin Receptors on the Human Sphincter of Oddi. Surgery, 114(5):942-950, 1993 Nov.
22. Egawa H, Esquivel CO, So S, Cox KL, Berquist W, Concepcion W, Lawrence L. FK506 Conversion Therapy in Pediatric Liver Transplantation. Transplantation, 57(8):1169-1173, 1994 Apr 27. 23. Egawa H, Berquist W, Garcia-Kennedy R, Cox KL, Concepcion W, So SK, Esquivel CO. Respiratory Distress from Benign Liver Tumors: A Report of Two Unusual Cases Treated with Hepatic Transplantation. J Ped Gastroenterol & Nutr, 19(1):114-117, 1994 Jul. 24. Menegaux F, Keeffe EB, Andrews BT, Egawa H, Monge H, Concepcion W, So SKS, Esquivel CO. Neurological Complications of Liver Transplantation in Adult versus Pediatric Patients. Transplantation, 58(4):447-450, 1994 Aug 27. 25. Egawa H, Woodley S, Keeffe EB, Concepcion W, Wiviott LD, Menegaux F, Esquivel CO. Aortic Valve Endocarditis after Orthotopic Liver Transplantation. Transplantation, 58(6):732-734, 1994 Sep 27. 26. Egawa H, Keeffe EB, Dort J, Concepcion W, Esquivel CO. Liver Transplantation for Uncontrolled Variceal Bleeding. Am J Gastroenterol, 89(10):1823-1826, 1994 Oct.
27. Menegaux F, Keeffe EB, Baker E, Egawa H, Concepcion W, Russell TR, Esquivel CO. Comparison of Transjugular and Surgical Portosystemic Shunts on the Outcome of Liver Transplantation. Arch Surg, 129(10):1018-1023, 1994 Oct.
28. Esquivel CO, Gutiérrez C, Cox KL, Garcia-Kennedy R, Berquist W, Concepcion W. Hepatocellular Carcinoma and Liver Cell Dysplasia in Children with Chronic Liver Disease. J Ped Surg, 29(11):1465-1469, 1994 Nov.
29. Wong L, Concepcion W, So SK, Egawa H, Menegaux F, Esquivel CO. Ex-Vivo Technique for Right Lobectomy in Pediatric Hepatic Transplantation. J Am Coll Surg, 179(5):601-603, 1994 Nov.
30. Dimand RJ, Burckart G, Concepcion W, Hall RJ, Bishop AL, Borland L, Starzl TE. Continuous Infusion Ranitidine in Postoperative Pediatric Liver Transplant Patients: Effects on Intragastric pH, Gastrointestinal Bleeding and Metabolic Alkalosis. Am J Ther, 1(4):281-286, 1994 Dec.